Villa Artemis is a stone built villa in the traditional village of Gavalochori, 25km east of Chania Crete. Its unique architectural style is combined with modern facilities in order to provide an ideal environment for your holiday. The villa features 350 m2 of living space on a 1000 m2 plot of land. It offers complete privacy with its own parking space for two vehicles, garden and two pools (one regular and one lap). The villa can accommodate up to 10 guests. It offers a stunning view of the White Mountains. Free WiFi coverage throughout the villa. Beach towels are provided. The pools operate from March 1 to October 30. Cleaning Service: Price includes daily maid service (bathrooms and bedrooms only), change of towels and linen twice weekly (more often if requested) and general cleaning once weekly. Catering Service, groceries delivery: We can arrange for daily delivery to the villa of meals of the finest Greek and local Cretan cuisine. We can also arrange groceries delivery from local supermarkets, butcher shop, fruit stands and bakery. Long term renting: The villa is available for long term renting at reduced rates during the off season (November to end of March). Please send us your request. 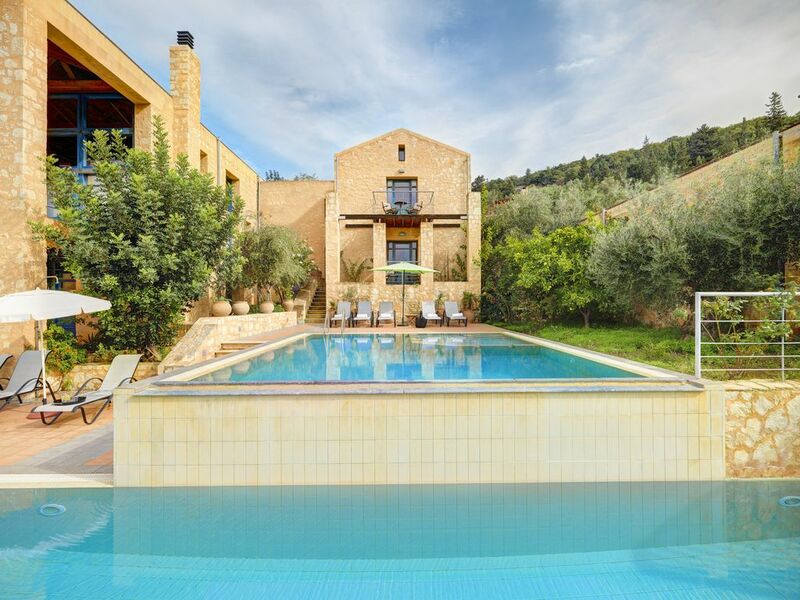 The villa is located on a hillside in the village of Gavalochori in West Crete. Gavalochori is a traditional Cretan village situated in the Apokoron region about 3km inland from the coastal village of Almirida. Its location is 25 km east of Chania which takes about 20 minutes drive along the National Road. Gavalochori is an old historical village with approximately 500 residents which has retained its color and way of life. Several family run tavernas offer the visitor tasty dishes of Cretan cuisine. Near the small village square and within walking distance from the villa there is a coffee shop, a bakery, a mini mart, two tavernas and the Folk Art Museum. The surrounding area has several beautiful nature paths for walking or biking which lead either towards the sea or towards the White mountains. The coastal village of Almirida is less than 10 minutes driving distance. In Almirida you may find all basic facilities, such as a supermarket, pharmacy, post office, bakery, ATM, gas station and taxi service. It has a wonderful sandy beach with crystal clear water and a shallow section particularly suitable for small kids. This Blue Flag rated beach is organized with sun beds and umbrellas and sea sports services. There are several sea side tavernas and bars offering exquisite sea food and night entertainment. The large town of Chania of course offers the visitor a wider range of choices for shopping, dining and night life mostly centered around the old Venetian port. Some interesting monuments in Chania town are the covered Municipal Market, the Venetian fortifications, the Egyptian Lighthouse, the Synagogue, the Fortress of Firkas, the Mosque of Giali Tzamisi, the Arsenals, and the Othrodox Cathedral. Each master bedroom has ensuite bathroom equipped with bathtub with hydro-massage. Regular pool size is 6m x 6m. Lap pool size is 18m x 3m. Up to two cribs and high chairs are provided for infants. A computer with internet connection is provided. Free WiFI access. Lovely villa located in a lovey small authentic village. Good location. Extremely spacious villa with great views. Mrs Froso the housekeeper/cleaner was on hand every day to help with any issues. Very private and very peaceful location. We had a lovely stay. Villa is a great building and although interior is very nice it isn’t luxurious. Bed mattresses could be better and sheets and duvets larger to stay on the bed. Downstairs bathroom had very unpleasant smell on several days and my daughters had to use our bathroom instead. Pool was great although being unheated a bit chilly this time of year. These are only minor points however and I would recommend the Villa. Location was excellent. The local seaside town had a lovely beach and good choice of restaurants. Easy to get to Chania which was charming - went twice. The coffee shop/restaurant in Gavalochori run by Monica was great! This was our second visit to Artemis and we all enjoyed it so much - the villa is perfect, the pools were in constant use by the grandchildren, Gavalochiri is a beautiful area and the village restaurants are excellent. I strongly recommend it. We recently stay here and it was wonderful, the Villa was clean and spacious and very well maintained, both inside and out. The pool area is great however I would have happily paid to have the pool heated as in early April the water was a little cold but I am sure as the weather improves there would be no requirement for the pool to be heated. We were meet on arrival and made to feel very welcome. The location is fairly remote and you do need a car but it is well worth it as the view is stunning, the snow covered mountains were breathtaking. The people locally in Gavalochori are friendly and welcoming and there are several good places to eat and drink and is prefect if you just want to relax and while away the hours, or if you are looking for a bit more a short 5 minute drive to Almyrida you will find ample bars/restaurants that are located on beach front. We went horse riding which was about 30 minutes away, Go Karting again about a 30 minute drive, and found many small beaches to stop at. Chania is well worth a visit the old town and port is charming and incredible pretty. My only one criticism would be that there is no proper shower, the jacuzzi baths were lush and overall the bedroom and bathroom areas were prefect but a proper shower would have been nice. I would definitely return, it was great value for money, would highly recommend. We stayed here for two weeks and it was a fantastic location - quiet and peaceful, but within walking distance of some lovely restaurants in Gavalochori village, and five minutes' drive to Almyrida with a huge selection of places to eat. The pools were fabulous, and it was wonderful to have a separate lap pool to do some 'real exercise' as well as the recreation pool to play in. The views from the balcony, where we ate our breakfast every day, were glorious. Christos was very quick to respond to any queries leading up to our stay, and Mrs Froso who cleaned the property daily was friendly and helpful. There are number of places to visit within easy reach of an hour's drive or less. We particularly loved the ancient ruins at Aptera, and the Botanical Gardens south of Chania. Rethymnon is also great for a day trip. Thank you very much for taking the time to let us know about your stay at the villa! We booked this villa because the photos looked great. When we got there it was even better than we imagined. Huge villa, two pools. Overlooking the mountains and you can see the sunset every night. I would definitely recommend! The villa is absolutely stunning place! Amazing view, amazing bedrooms... everything is just perfect. Around the area is plenty of places you can drive to and see beautiful beaches or traditional villages. We knew it will be beautiful before we went but we didnt know it will take our breath away when we arrive. Gavalochori is a traditional Cretan village situated in the Apokorona region about 3km inland from the coastal village of Almirida. Gavalochori is an old historical village with approximately 500 residents. It is a typical Cretan village with a small square where a coffee shop, a bakery, a mini mart, two tavernas and other convenient stores can be found. Several narrow streets branch off its centre and one could wander through several interesting sections of this officially protected village. Stone built houses with lovely backyards full of colourful flowers can be found. A lot of interesting buildings can be seen, such as the 18th century two-roomed, arched olive oil press, the temples of Panagia and Agios Sergios, the old school, and the historical folk art museum. Within a short distance (5km) from tranquil Gavalohori one can drive to Almirida, a picturesque coastal village. You may dine there in one of several seaside tavernas or relax sipping your drink by a bar during sunset. GENERAL NOTES FOR RENTAL RATES • We accept payment by bank wire or credit card or Paypal • Prices include VAT and all expenses. • No security deposit against damages is required.